Reports are hitting the media about draft amendments to international whaling rules that are meant to bring Japan, and other whaling nations, back under the rule of the International Whaling Commission. The amendments in effect will allow nations that are already killing whales to keep on doing so with the approval of the IWC, provided that they limit the numbers of whales they catch. The exact limits are yet to be decided, and of course will only apply if the draft amendments pass. The International Whaling Commission is established under the International Convention for the Regulation of Whaling. There is a Schedule to the Convention – that Schedule is where the current rules about whaling are written down. The draft amendments were written by the Support Group to the “Small Working Group” of the IWC. The “Small Working Group” meets from March 2-4 2010 in Florida, where the changes will be discussed. The exact changes that are proposed can be downloaded here (pdf file). The Small Working Group’s report will be discussed at the 2010 Annual Meeting of the IWC to be held in Morocco from May 27 – June 25 2010. The full Annual Meeting would need to approve any changes to the Schedule. In order to improve the conservation of whales, the number of whales taken for each of the years indicated above shall not exceed the catch limits shown in Table 4. No Contracting Government will unilaterally authorize any whaling in excess of the limits shown in Table 4 or outside the provisions of chapter VII. If the results of the established management procedures indicate that a catch limit should be lower than the number in Table 4, or if there is a significant event that negatively affects the status of any population, the Commission shall reduce the number of whales taken for each subsequent whaling season during the currency of this chapter, in accordance with the advice of the Scientific Committee. Catches from the stocks included in Table 4 shall not be authorized by Contracting Governments that did not authorize whaling operations in those areas in 2009. Table 4 allows whaling to happen in the Southern Ocean. The Australian Government has rejected this already, and issued a counter-proposal which calls for whaling to end in the Southern Ocean in five years’ time. This would provide a period of stability during which the Commission will be able to undertake a review of other matters and further work on the reform of the organisation. These matters would include, inter alia, research under special permit [that is, “scientific” whaling], the commercial whaling moratorium and objections and reservations. The Climate Resistance blog, despite its rather odd-sounding name, is one of the better anti-climate-alarmism sites around. Instead of diving into the nuttier depths of the “It’s a UN conspiracy to take over the world and hand it over to the Jews bankers” arguments, it tackles the real issue in the climate debate head on. The argument is really about how climate ‘science’ turns into ethical imperatives and politics. Our argument here is that ‘catastrophe’ is the premise of climate politics, not the conclusion of climate science. With arguments like this emerging from academia, it is no surprise that people sense the snake oil, and head for the science as the object of the debate. We’ve said before that this is a mistake that sceptics make. They mirror their counterparts such as Sachs and Corner, who believe that the debate begins and ends in “the science”. As we point out, probably too often, the politics is prior. It is Sachs and Corner’s politics which stinks. “The science” is an afterthought. It’s been argued here before that this is the most important factor about the global warming debate. Even if humans are causing the climate to warm – even if that is an undisputed scientific fact – that fact doesn’t mean that the “science” can tell us what political decisions we need to make. The response to global warming is a political one, not a scientific one, and once the scientists have described what is happening, they have no more authority than any other reasonably well-informed citizen. The Australian Federal Court ruling in favour of Larrikin Records has raised again the issue of ‘Intellectual Property Rights’. For overseas readers, the case concerns the borrowing or adaptation (or ‘sampling’ to use a hip-hop term) of an old riff, written in 1930, from a song about a kookaburra, adapted by the Australian band, Men at Work, in their international hit, ‘Down Under’. The author of the kookaburra song died in 1988 and the song was purchased by Larrikin Records after her death. Men at Work had a hit with ‘Down Under’ in 1981/82. There’s a lot of discussion happening about this ruling, and public opinion is generally favourable to Men at Work and against the Court ruling. People understand that music – and culture in general – does not develop in isolation. As Helen Razer put it in today’s (February 6th) ‘Age’ newspaper: “The history and the advancement of all artistic endeavour rests on borrowing; on using and changing leitmotifs”. I’d add that there’s more to it than that (for example, there are the revolutionary leaps, the breaking of the rules of musicality and rejection of tradition as found in Thelonious Monk’s dissonant harmonies), but it’s a valid observation in terms of the Court ruling. The point that none of the commentators has made, as far as I’m aware, is the question of a social system based on private property. The singular focus is on how to improve the law, make it more in keeping with the times (when new technologies have made ‘sampling’ commonplace). The law should certainly be reformed – but what does this case say about private ownership of culture, of music, and what does it suggest about the alternative, social ownership as the basis for production? A common argument for capitalist property relations is that they favour individual creativity, that culture is experimental and flourishes under them. Yet how true is this when a riff, in music, can be owned privately (by a company – one, incidentally, that had its origins in the ‘left’ nationalist folk scene)? Where music has developed, progressed, under capitalism it has tended to be in spite of the system of private ownership. The development of rock music, and all the 1960s pop rock bands (for example), owes more to the fact that the shuffle of Bo Diddley and the riffs of Chuck Berry were never patented. Had they been, the countless great bands, including the Beatles and Rolling Stones, would have been up on ‘theft’ and crushed from the get-go. Despite capitalism, ‘everyone’ owned Bo Diddley’s shuffle, as surely as everyone owned the basic twelve-bar-three-chord blues progression that emerged from the mists of time. (Okay, I’m being melodramatic about the mists of time – it’s just that I love that old blues stuff). Eric Burdon once remarked of Jimi Hendrix that “He took blues music from the Mississippi Delta way up to the planet Venus”. This could only happen because the structure and style of Mississippi Delta blues was not owned, patented, by some big capitalist outfit. The proof that social ownership is more conducive to creativty and musical development and innovation is thus found within capitalism itself; in its antithesis, which exists within it, waiting to break free. And to go places way beyond Venus. We cannot just stand by mutely, so people around the world are gathering to bear witness. 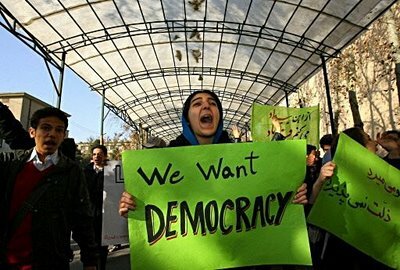 Iranians around the world will stand together on February 12 in solidarity with their brothers and sisters inside Iran to show them that they have not stopped caring. We in Melbourne on Friday 12/02/10 from 7-8 pm, will form a human chain over Princess Bridge along St. Kilda Rd to take part in this global action against injustice, and to condemn recent executions and unfair trails. We will hold a 200m-long green scroll with our slogans written on it. We want you to be there to echo our voice. I think those of us who are in Melbourne should go along. A new blog, SA Votes 2010 Uncensored, will defy new South Australian laws banning anonymous political speech at election time. The blog will mainly post links to stories about the SA election but will allow anonymous comments on the election, without forcing commenters to publish real names or postcodes, and without forcing commenters to provide their address to the blog publisher. The new law means that anyone commenting on a “journal”, including journals published on the Internet, must leave their real name and postcode, and the journal must collect and hold for six months their name and address. This law is so easily defied that it can easily be made unworkable, which is the point of the new blog.